WASHINGTON -- The price tag for Obamacare will be lower than previously expected, independent federal auditors reported Monday in the latest downward revision of the cost to taxpayers of reducing the number of uninsured Americans. Net spending on subsidies for private health insurance and greater enrollment in Medicaid and the Children's Health Insurance Program will total $1.2 trillion from next year through 2025. That's 11 percent less than the Congressional Budget Office projected just two months ago. The new estimate doesn't account for spending cuts and tax increases in the law, which the budget agency previously projected would result in a net decrease in the federal budget deficit because of Obamacare. A continuing, historic slowdown in the growth of national spending on health care during recent years is one major reason for the Congressional Budget Office and Joint Committee on Taxation's re-evaluation of the Affordable Care Act's cost. Economists agree that the recession and slow recovery played a major role in keeping down health care spending as Americans' wallets were tight, and experts predict that spending will rise more quickly as the economy continues to improve. No consensus has emerged regarding the influence of Obamacare's cost-containment initiatives on this trend, but the congressional scorekeepers have incorporated lower health care spending and lower premiums into their calculations. "Although it is unclear how much of that slowdown is attributable to the recession and its aftermath and how much to other factors, the slower growth has been sufficiently broad and persistent to persuade CBO and JCT to significantly lower their projection of federal costs for health care," the new report concludes. That shift in overall health care spending trends is reflected in health insurance premiums that are lower than anticipated. Over the course of the budget watchdogs' 10-year estimate, health insurance purchased on an Obamacare exchange will cost about 10 percent less than expected, the report says. The agencies predict higher premium increases in 2016 through 2018 for the "benchmark" insurance policies used to set subsidy levels in each local market. But they expect that hikes will be smaller from 2019 onward. More than 11 million people have signed up for health insurance on the Affordable Care Act's exchanges this year, and Medicaid and the Children's Health Insurance Program have gained 10.8 million beneficiaries since the beginning of Obamacare enrollment in October 2013, according to the Department of Health and Human Services. The national uninsured rate during the first quarter of this year is 12.3 percent, down from 17.3 percent a year before, Gallup reported last week. But this progress could be undone by the Supreme Court, which may eliminate the subsidies that enable health insurance exchange enrollment in more than 30 states when it issues a ruling in a lawsuit later this year. The Congressional Budget Office previously projected that 12 million people would be covered by insurance policies obtained via an exchange this year. But it has reduced that prediction to 11 million, in part based on the expectation that a significant number of enrollees will give up this coverage, either to obtain insurance elsewhere or to become uninsured. By 2025, it's expected that 22 million people will buy health insurance from an exchange, or 2 million fewer than projected in January. Over the next 10 years, 7 million fewer people will get health benefits from employers, CBO projects, compared to the 9 million fewer that the agency predicted in its earlier report. The Medicaid and Children's Health Insurance Program rolls are now expected to grow by 14 million people over the next decade. In its prior report, CBO had estimated that 16 million people would sign up for these programs during those years. The agency also increased its projections of Obamacare's effect on the uninsured. According to the new report, the law will cover 25 million people in 2025 who would otherwise be uninsured; the last report predicted it would be 24 million. In addition, the CBO now expects that in a decade 25 million people will remain uninsured. This segment of the population will be a mix of people who decline to obtain available health coverage, individuals living in states that didn't expand Medicaid eligibility as permitted by the Affordable Care Act, and undocumented immigrants who aren't allowed to use the exchanges or enroll in Medicaid. The Congressional Budget Office and Joint Committee on Taxation's revisions for the near future are even more significant than the revisions for the longer term. Over the next four years, spending on the Obamacare coverage expansion will be 29 percent lower than what was estimated in 2010, when the Affordable Care Act first became law, the CBO reports. In 2019, this spending will be one-third less than the agency projected five years ago. 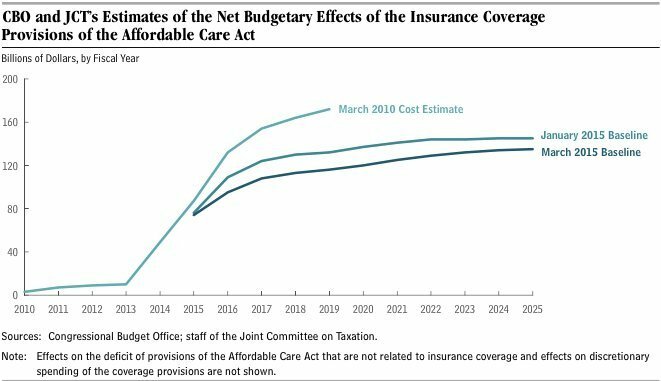 "When compared year by year, CBO and JCT's estimates of the net budgetary impact of the ACA's insurance coverage provisions have decreased notably, on balance, over the past five years," Monday's report says. Subsidies for health insurance plans sold via the exchanges will cost taxpayers $849 billion from 2016 through 2025, or 20 percent less than a prior estimate, CBO reports. The projected cost of increased Medicaid and Children's Health Insurance Program during those years will be $847 billion, an 8 percent decline from the previous report. The new findings from the Congressional Budget Office and Joint Committee on Taxation represent a mix of adjustments to spending and tax revenue in both directions, with some spending and tax-collection metrics increasing and others decreasing.